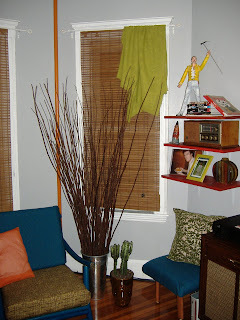 Apartment 528: Extreme Livingroom Makeover, Part 7: Almost There! 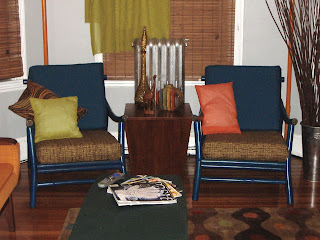 Extreme Livingroom Makeover, Part 7: Almost There! After weeks of searching for the perfect fabric to cover my chairs, I found just what I was looking for in the remnant section of the fabric store in Dorchester (more on that tomorrow). It's a retro fabric with several different shades of brown. The colors are nice and neutral and the pattern adds some texture without being too busy. My first thought was to cover the whole chair in the brown fabric, but after doing a mockup, I decided it was a little too much brown. So I chose to do the top green and the bottom brown, but the green was too much of a contrast against the blue of the chair. Thankfully I had my trusty assistant Jerome there to pick out the blue which blends in with the chair while still adding a pop of color and intrest. Perfect! Looking back at the old pics from when I first bought them, it's hard for me to believe these are the same chairs...they're so cute now! 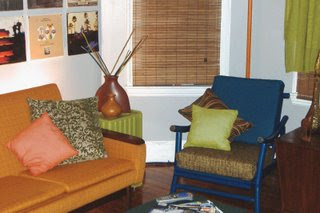 A dash of paint and a few yards of fabric can really go a long way! I was apparently on a project high because I didn't stop at recovering the chairs...I went on to hang the new bamboo blinds (Kmart) and paint the pipes a nice shade of orange. Unfortunately, I ran out of steam before I could get to the cutains. I've decided to go with green, though I can't decide whether I want to do a simple fabric-covered cornice box or if I want actual curtains. I'll most likely do the cornice...why make more work if I don't have to?! After that it's pillow making time. I'm not satisfied with the quality of some of the pillows I first made and I have some leftover fabric so, why not? Once the pillows and a couple odd jobs are done, the room will be officially FINISHED!! That's right, finished! I can't wait. This room has been my pride and joy. I've found several other cute items that would like nice in the room, but I don't want to be one of those people who just doesn't know when to stop. They start with a few Christmas lights and the next thing you know there are inflatable snowglobes and giant Santa's covering their lawn. Tacky is NOT very becoming!